Lovely. Well, except for the big old Nissan ad. Controlling your ride has quite a good feel using either the standard Dreamcast control pad or a racing wheel. Three driving difficulty levels can be selected. In the tame "beginner" mode, braking duties are offloaded to the computer and driving aids are turned on to prevent spinning out. In "intermediate" only the driving aids are turned on, while "expert" eliminates all aids and lets players ride bare back. While set at the "expert" level, control is still somewhat mild in comparison to F355's unrelenting realism, but is still sim enough to give seasoned racing jockeys a healthy workout. Race fans will be happy to know that the real-life tactic of drafting (pulling into the slipstream of the car ahead in order to decrease drag) realistically provides an increase in speed. And for those that prefer to take corners in Sega Rally fashion, power-slides are possible, but not recommended if you hope to achieve fast lap times. 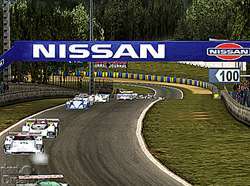 Game modes are broken up into "single race", one race with any car on any track, "time trail", where you race only against the clock, "multiplayer", for up to four players at once, "championship", which offers successively more difficult groups of races, and "24-hour Le Mans", the marathon French race the game is based on. While the former four are pretty standard in racers these days, the Le Mans race is where the real innovation lies. Here players have the option to drive a full 24-hour race (with save points during pit stops) that come complete with time of day and weather changes. Endurance style racing such as this provides some welcome strategy, because players must constantly be mindful of fuel levels, tire wear/type of tire, and weather conditions in order to stay in contention for the prize. For instance, a player may have to make a trade off by not pitting on a specific lap even though his/her tires are not suitable for driving in the incoming rain, because they have enough fuel to make it around again, and doing so will allow him/her to skip the last round of pit stops. 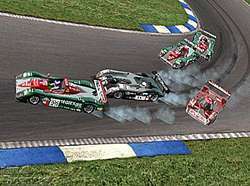 Don't you think it's about time we see some real racing strategy like this in more than just the F1 games? Oh, and for those of you who don't think you're the type that can stomach 24 hours of circling the same track, you'll be thankful that an option is available to run compressed Le Mans races of 10 minutes, 30 minutes, 1 hour, or 6 hours. I have a feeling that even one hour would be pushing it for a lot of people, so it's nice to have the various compressed options. There isn't much to say about the sound except that it's good. Every car has its own distinct engine sound, and changing gears is accompanied by a realistic clunk. All sound samples are nice and crisp and help to create the illusion of real auto racing. Music comes in two selectable styles, classic 80's guitar rock, or dance-ish stuff with a heavy beat. There's not much to say except that it's passable, and didn't drive me mad. Hairpin turns can test your driving mettle. Melbourne House has done an admirable job in creating a game that is very solid in all the core areas, but the team has also made some annoying oversights. For starters, seeing as though this is a racing game, one would think that adding the ability to set the travel and dead-zone of the steering wheel controller would be a no-brainer... right? Guess not. For someone who is quite used to setting his/her wheel travel to a lesser degree than the default, this omission is quite an irritation. Also annoying is that it isn't possible to save or load a game from any other memory card other than the VMU in controller port A, slot 1. Aside from those nuisances, there are some gameplay issues to mention. The most significant offender is the relationship between driving difficulty and AI difficulty. Players choosing a more difficult skill level need to contend with not only more difficult controls but also faster and smarter AI. Separating the two would have been a better design decision because, for instance, there may be gamers out there that enjoy the driving realism of the "expert" skill level but also don't want to be left in the dust after only a single misstep. Taken as is, players may find that their preference lies somewhere in between the three skill levels offered, and thus may not give this title the playing time it deserves. There are some graphical faults as well. While the glowing brake disk effect really is awesome, there are times when the glow is visible not only through the spokes in the wheels, but through the car body as well! I find this kind of distracting. Also, the car textures would benefit from a higher resolution and better filtering, because they currently look rather blocky when viewed close up. Lastly, the remarkable draw distance of the track objects also comes with a couple small hitches. For one, when cars move further and further away from the camera, it is noticeable when they switch between LOD models. And secondly, some roadside objects like signs and bystanders pop-in at noticeable distances. Granted these two are very minor errors, but they are blemishes nonetheless. I'll wrap up with my general wish list for Test Drive: Le Mans 2. A rear view mirror would be a nice addition, and how about some in-depth car adjustments for the wrench heads out there? Dynamic lighting from the cars headlights would add to the realism/gameplay, and a fully modeled/animated pit crew would also be sweet. Finally, I'd probably hear it from you guys if I didn't mention how nice it would be to see everything running at a buttery smooth 60fps. Overall, Melbourne House and Infogrames have themselves a genuine winner on their hands with Test Drive: Le Mans. With it's innovative full 24-hour racing mode, beautiful graphics, solid control, and tons of details, Le Mans finds itself in the company of the finest racers gamers have ever seen. It strikes a wonderful blend of arcadey-sim style racing, and fans of the genre will find plenty to like here. It would be a shame if anyone missed out on one of the best racers this year simply because of its name. Toss in the fact that it retails for only $30, and you have an essential purchase for serious racing fans. Highs: Some of the best graphics yet seen, solid control, 24-hour racing, weather changes, details, fun, challenging. Lows: Driving and AI difficulty linkage, lack of steering wheel settings, inability to load from other memory cards.